On this first day of March, snow over two feet deep, temperatures hovering in the 20s F with a bracing northerly breeze here in Maine, I think back to March a year ago when I was in warm England. 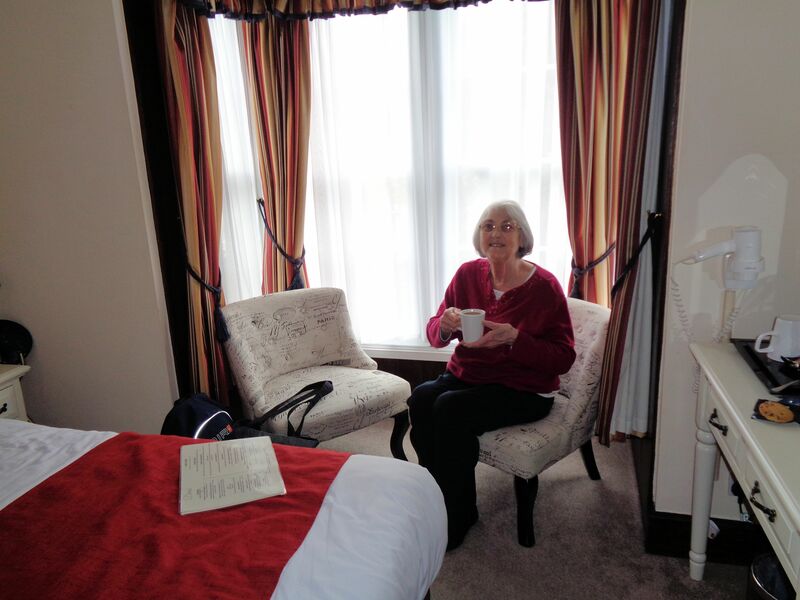 My mum and I spent a delightful couple days in Canterbury. 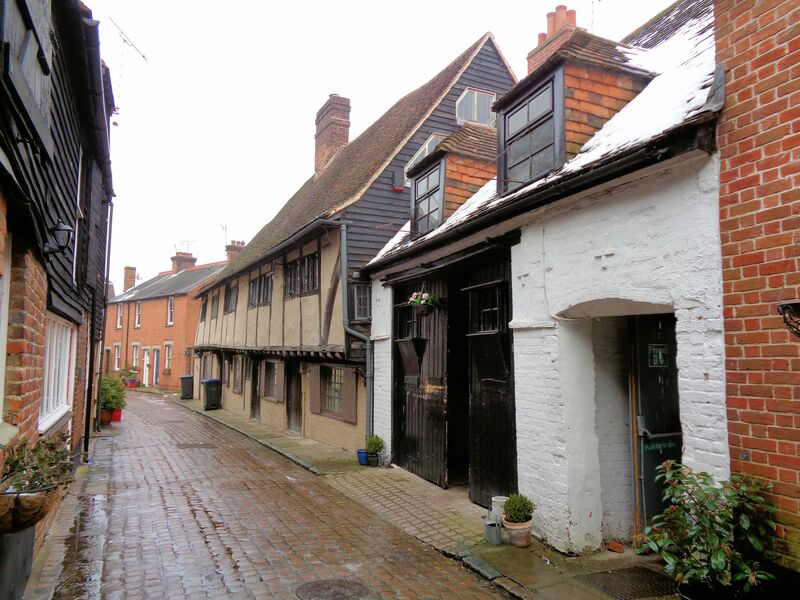 This town is one of the larger in Kent and the seat of the English church since the 600s. 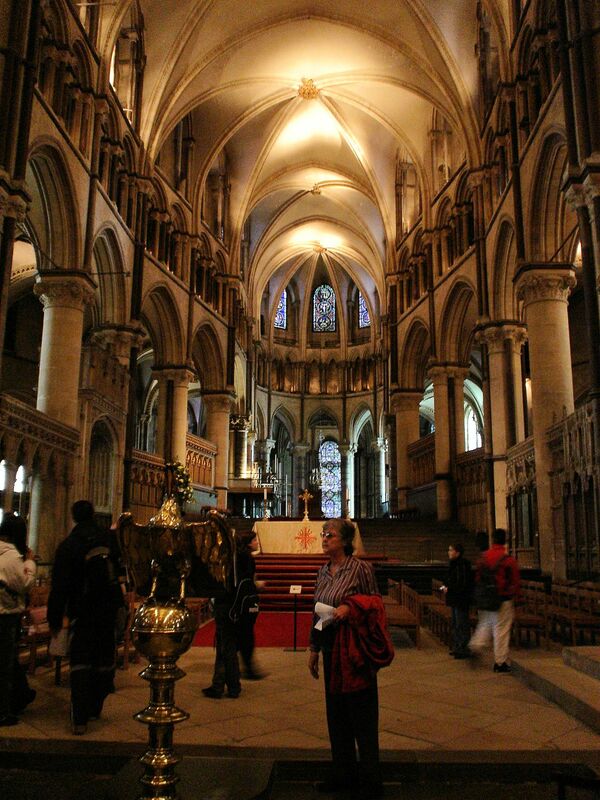 Although it is a religious center and the destination for thousands of pilgrims over the centuries, Canterbury is much more than its cathedral. 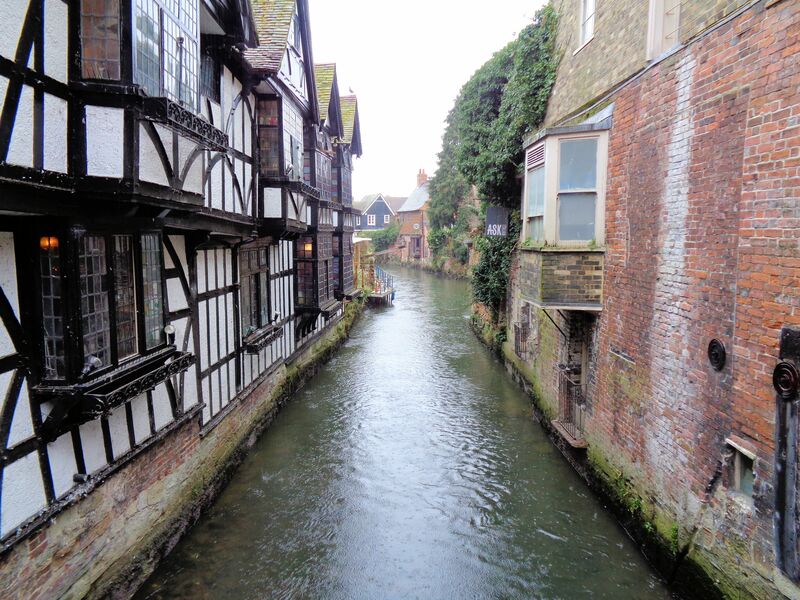 In ancient times the site of Canterbury was a settlement at the mouth of the River Stour. It was situated on the banks of the river’s large estuary opening into the Wantsum Channel, a wide arm of the sea that once formed an island out of Kent called the Isle of Thanet. Great storms over the centuries silted in the channel, creating dry land. The river now runs about twelve more miles to join the sea beyond Sandwich. The Romans built a town called Durovernum Cantiacorum after their invasion in the year 43. By the year 200 they had completed a wall around the town. 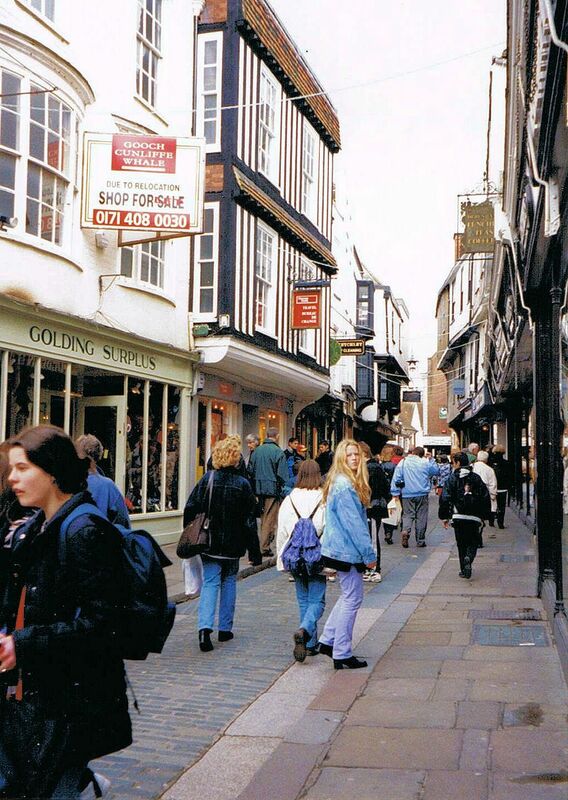 The wall was rebuilt in the Middle Ages and portions of it still stand for the strolling pleasure of tourists today. 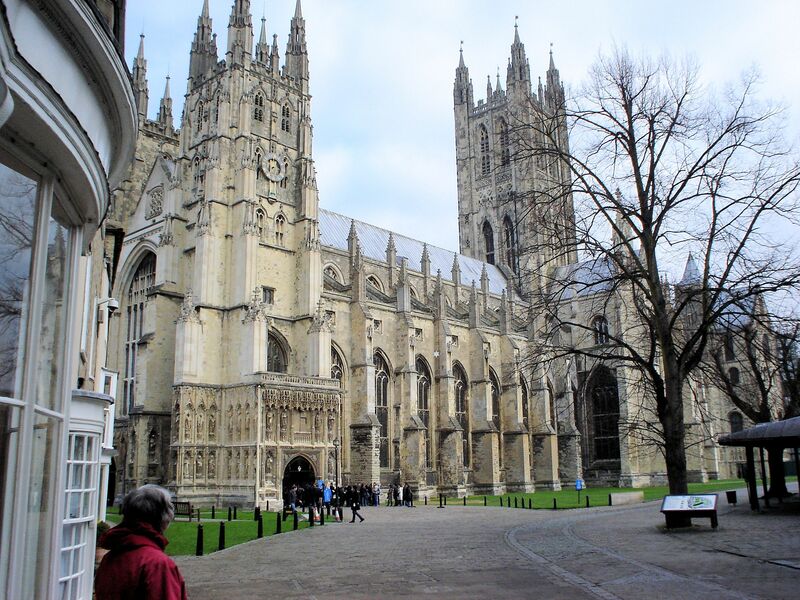 In the late 500s Canterbury was the capitol of the Saxon king of Kent who married a Christian. Her influence likely brought about the mission of St. Augustine, sent to England by the Pope to convert the inhabitants to Christianity. Augustine founded the cathedral after he was made Bishop of England in the early 600s. The current building dates from medieval times. 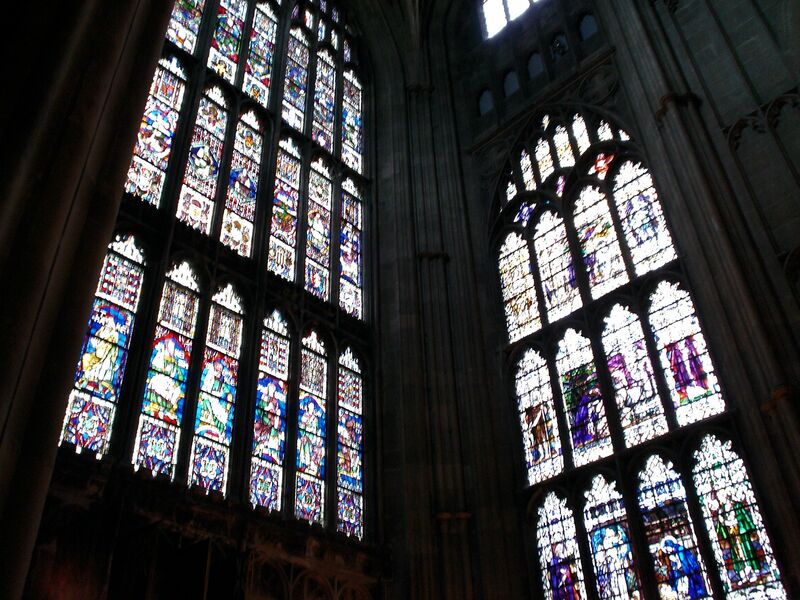 It has been repaired on several occasions: after various fires, following periodic neglect, and the depredations of the Puritans during the Civil War when stained glass windows were smashed and horses were stabled in the Nave. 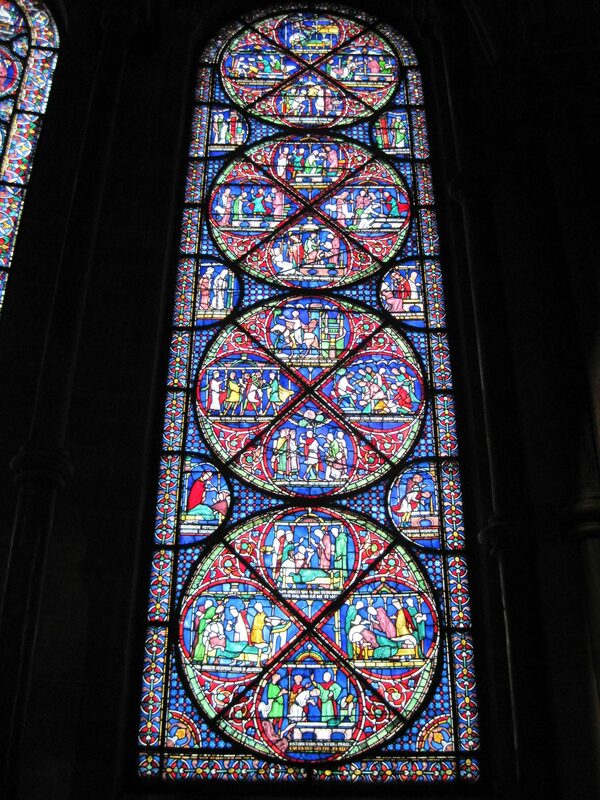 The oldest section is from around 1077 and is called the Martyrdom. 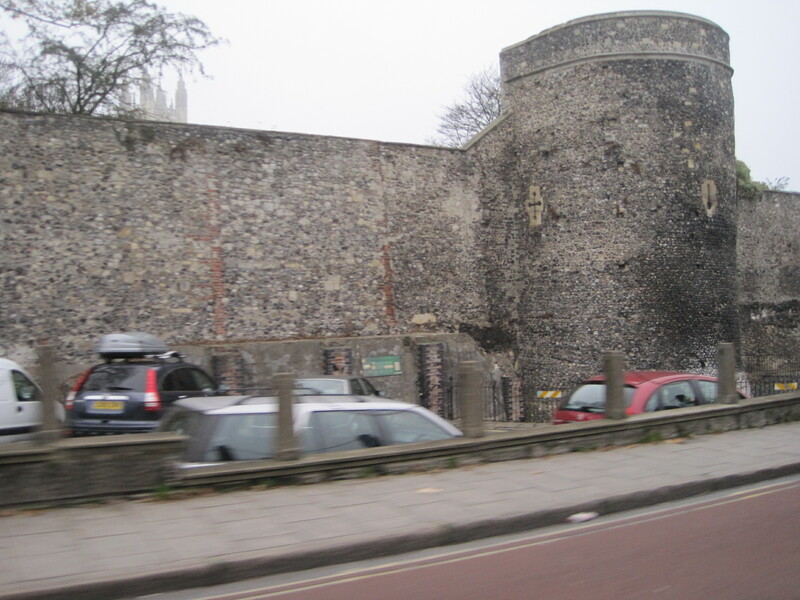 It is a staircase and parts of the north wall, the area reputed to be the site of the murder of the Archbishop Thomas Becket. 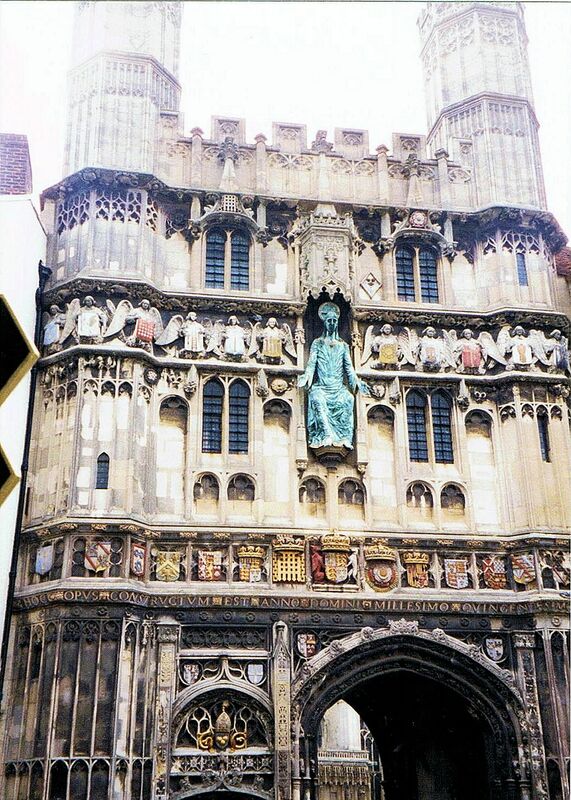 After his death on 12/29/1170, rumors of miracles brought a flow of pilgrims to Canterbury that has not fully abated. 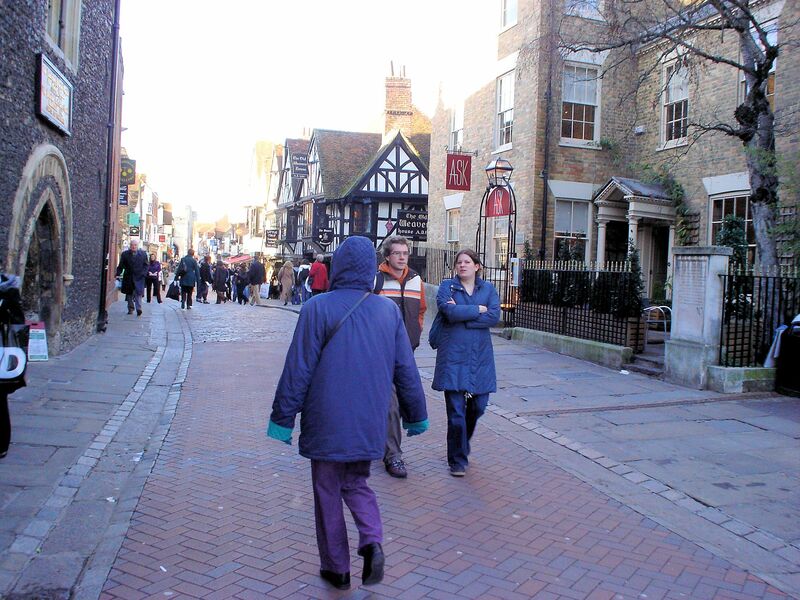 The Canterbury Tales by Chaucer tell of life on the pilgrimage and are a popular motif in the town. After the obligatory visit to the cathedral, the remainder of the town beckons. 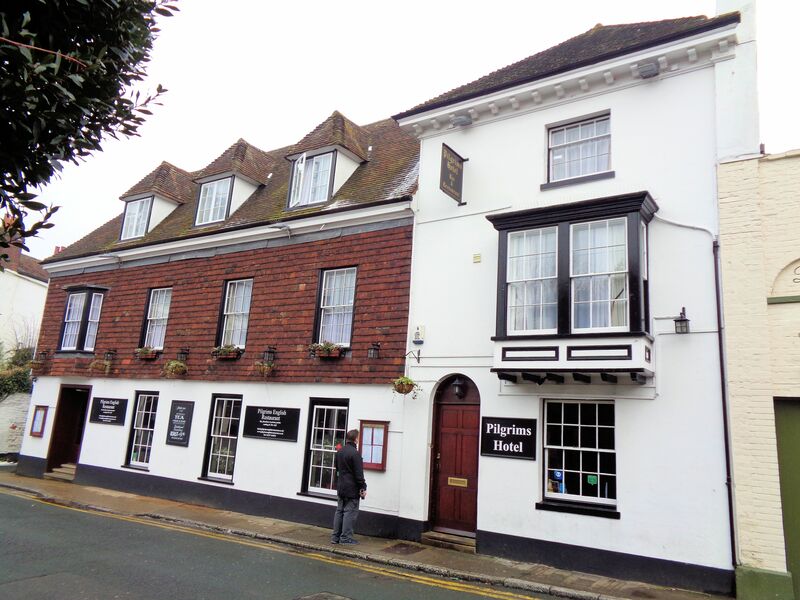 My mum and I stayed the weekend in one of the oldest buildings in the town, constructed in the 1500s as an inn, and currently the Pilgrims Hotel. 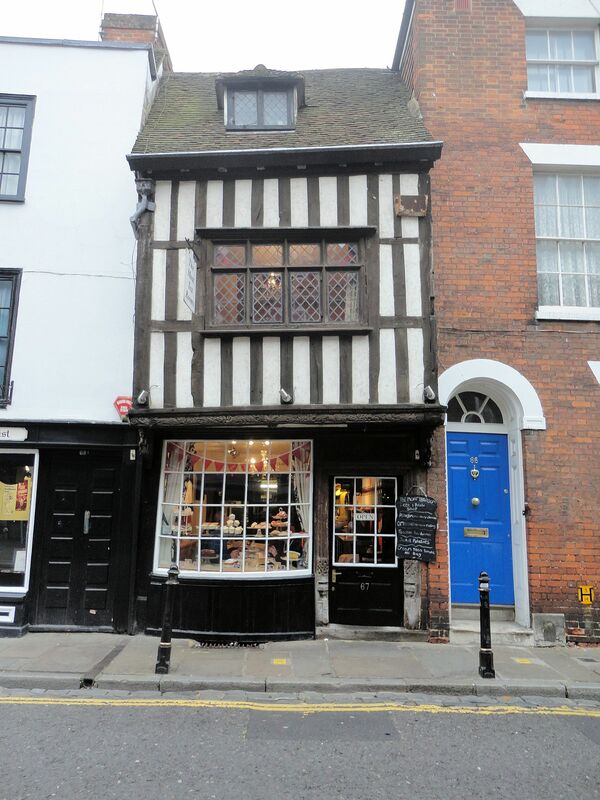 The place is charming and transports one back in time with its large common room, narrow stairways and cozy rooms. Our room was situated above the taproom and the ambient sound of chatter and music drifting from below was undoubtedly much the same as it would have been in the 1600s. In the photo below, our room was the one with the double windows overhanging the entry and sign. 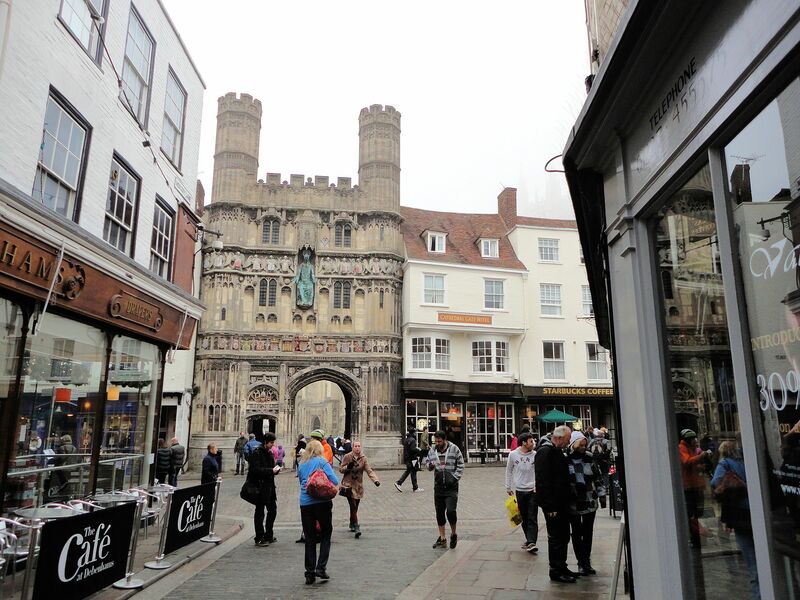 After a lovely cuppa tea and some biscuits, we explored the famed high street shopping area of Canterbury. 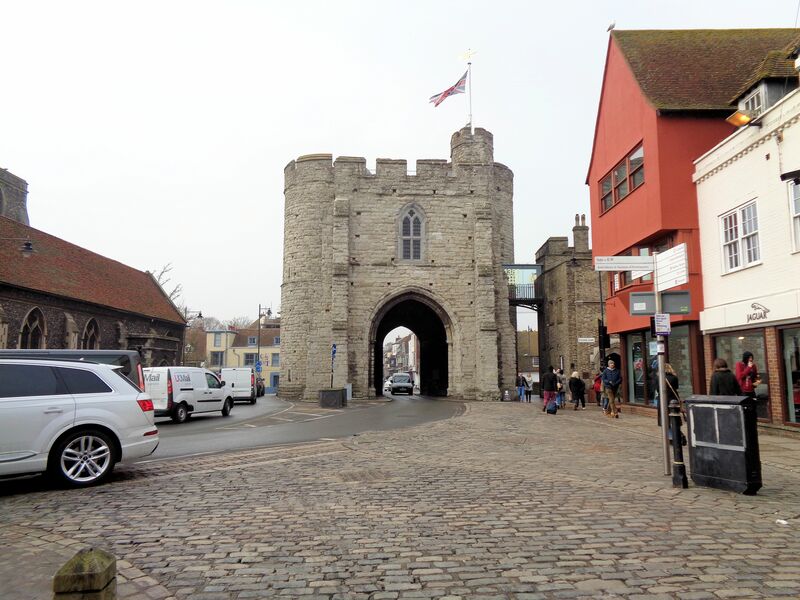 Extending about one-third mile from the Westgate (the only remaining medieval gate in the city wall) to Whitefriars Shopping Centre, the streets are closed to traffic during the day, creating a bricked pedestrian way often crowded with shoppers. 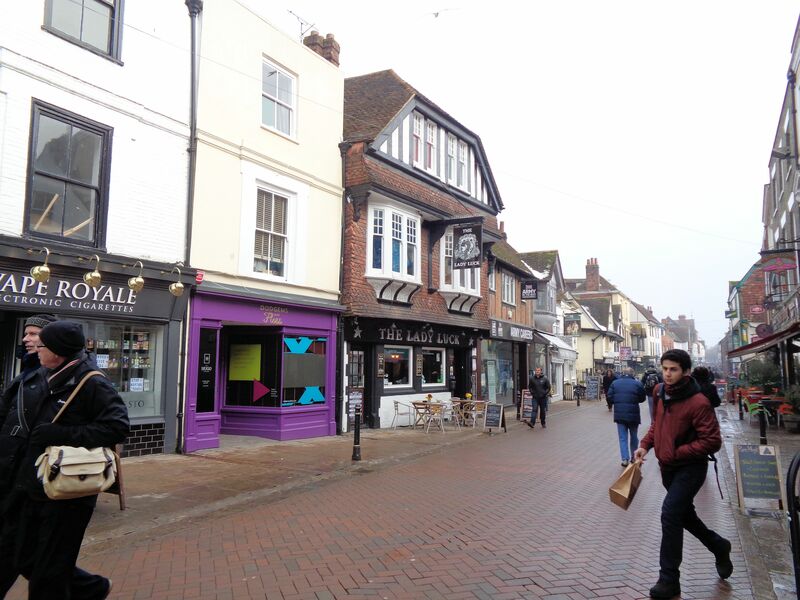 The thoroughfare is lined on both sides (and down side streets) with shops. It is such a great draw that at times navigating through the crush can be difficult. Buses disgorge large groups of tourists, often from non-English-speaking places, who traverse in impenetrable packs. Buskers strum guitars and play other instruments, adding music to the scene. Street vendors sell roasted nuts, hot snacks, nick knacks and trinkets, further narrowing the congested ways with their carts. Yet, it is a congenial crowd, well fed at the numerous restaurants and sated by endless purchasing opportunities. 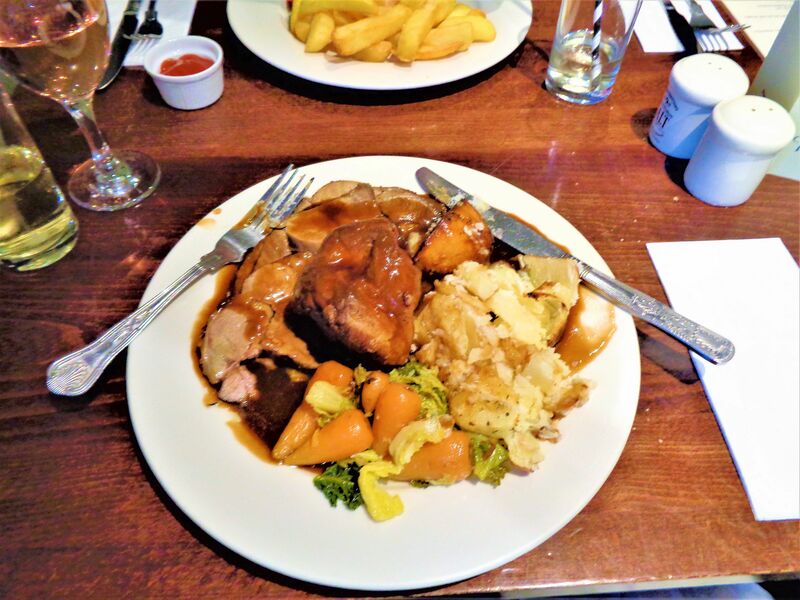 After a strenuous day of shopping, I enjoyed a lovely roast of lamb in our hotel’s taproom restaurant. With a nice glass of rose, it was a scrumptious way to relax. 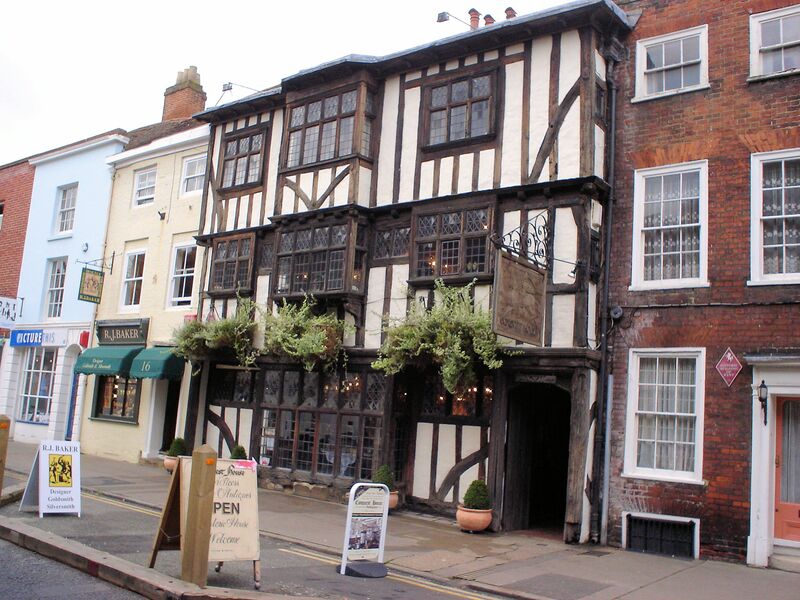 Canterbury is such a fun town that I hope to return for another stay and to perhaps catch a performance at the Marlowe Theater, a popular playhouse just across the street from our hotel.